One needs to consider the amount of sprinkler heads needed to cover area irrigated. Consider the distance from water supply to the outlet point, along with the pipe size needed or currently used. Pipe size and length will affect the friction loss, therefore needs to be considered. Centrifugal pumps need to operate in clean water with temperatures not exceeding max of 50’c. A pressure gauge should be placed on the outlet pipe. Flow switches or control switches must be used in conjunction with pump operation. 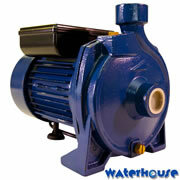 Centrifugal pumps should be installed be an electrician.